The Department offers state of art treatment to all classes of patient. The Department has an annual patient turnover of about ————- through its general OP wing. It is a facility which offers comprehensive health care for women of all age groups – the adolescent, the reproduction and the mature woman. The services of a trained specialist and a team of postgraduates are available 24 hours a day. The Department of Obstetrics and Gynaecology has a full fledged teaching programme encompassing both undergraduate and post graduate teaching. Vertical teaching highlighting basic sciences. Increased use of community based teaching. The labour rooms are modern. They function round the clock with a trained and dedicated team. They are attached to theatres for emergency care and an anaesthesiologist and blood bank facilities are available 24 hours a day. Cardiotocography is used to monitor all patients in labour. Pain free labour is available with epidural analgesia and entonox readily available to all. Ultrasonography is available for monitoring of antenatal patients. Outpatient management and gynaecologic malignancy screening is on par with international standards with pap smear, colposcopy, office endometrial biopsy and transvaginal ultrasound available. Day care operative services include suction evacuation, D & C, Diagnostic hysterolaparoscopy which ensure the dual advantage of excellent patient care and patient convenience. Adolescent Gynaecology and Endocrinology workup is available for all patients. Mature woman clinic concentrates on preventive gynaecology like cancer screening and other gynaecological problems specific to peri menopausal age group. The department is well equipped with adequate staff, faculty and equipment capable of handling all types of procedures and emergencies benefiting people from not only Srikakulam district, but adjoining districts of Orissa. Our vision is to excel in the field of teaching, learning, research and innovative clinical practices. To be a department of excellence for training students. Teaching Aids Available : Equipped with department library, Digital Central Library with access to E-Journals , e-books. 2. 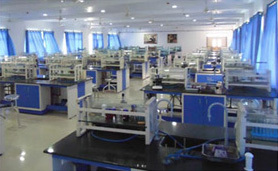 Laboratory Facilities : Blood Bank, Central Diagnostic Lab, Imaging Lab , Central Research Lab. Departmental Library – Books & Journals. To promote use of advanced technology in Ophthalmology patient care. To work with commitment for better patient outcomes. To provide quality education to medical students and conduct quality research. Increasing pass percentage of UG’s to 100%. Improving surgical skills of post graduates. Our department offers quality out-patient and in-patient services to patients through a team of dedicated specialized ophthalmologists. Our OPD works on all weekdays from 8.30 A.M. To 4.30 P.M. And emergency care is available round the clock. The OPD has all the necessary instruments like Autorefractometer, Keratometer, A-scan, slit lamp biomicroscopes etc. We have various sub-specialties like Cornea, Retina, Glaucoma, Squint etc. We have a dedicated eye bank which is actively involved in procuring eyeballs and involved in corneal transplantation surgeries. Medical retina is well established with ultrasound B-scan, Fundus camera and Diode laser facility. YAG LASER is also available. Glaucoma clinic has latest Humphrey Field Analyzer along with other necessary equipments. The Department has progressed well from its initial stages, to a fully equipped department with state of the art OT infrastructure and skilled faculty capable of handling trauma cases and specialist operative procedures like arthroscopy and arthroplasty. We are even performing Total Knee and HIP replacement for several patients. To train the faculty and the postgraduates to face the challenges faced . The Department, through its various wings provides total health care to the children. It has well equipped neonatal and Pediatric intensive care units and specialty clinics to cater to the needs of children of all age groups. To be one of the best academic centers for Pediatrics. 1.To Impart knowledge, skills and competencies in child health care to graduate and post graduate students. 3.To conduct quality research and find innovative solutions for improving the child health. To achieve competency in patient care that is compassionate, appropriate, and effective for the treatment of health problems and the promotion of health. Faculty and residents must be able to provide family centered patient care that is developmentally and age appropriate, compassionate, and effective for the treatment of health problems and the promotion of health. To have competency in interpersonal and communication skills, which results in effective information exchange working with patients, their families, and other health professionals. Residents must be able to demonstrate interpersonal and communication skills that result in effective information exchange and teaming with patients, their families, and professional associates. Faculty and Residents must demonstrate competence in the use scientific methods and evidence to investigate, evaluate, and improve their patient care practices. Faculty and Residents must demonstrate a commitment to carrying our professional responsibilities, adherence to ethical principles, and sensitivity to diversity. Faculty and Residents must develop the skills and attitudes necessary to function as a life-long teacher of self, peers, patients/families and the community. Residents must demonstrate competence in this area. The department viewed a tremendous flow of inpatients and students/interns were exposed to a wide array of psychiatric ailments. During this period, a high end modernized digital EEG machine was procured for the benefit of epileptic patients in terms of diagnosis. More psychometric instruments were also purchased for the benefit of the patients. It was during his tenure, a separate psychiatric ward was established with 15 beds. All acutely ill patients and other chronic schizophrenics were admitted and provided holistic care. To be a state-of-art Psychiatric facility in Srikakulam providing education, service and conducting Research in catering to the needs of the community in and around srikakulam district. To improve upon the existing facilities in the department and start Post-graduate course. a) To introduce Postgraduate course in the department. b) To train the medical graduates to treat common mental illnesses. c) To provide opportunity for the staff to participate in any on-going faculty development programmes. d) To ensure optimum participation of staff and students in CME /Conferences/Workshops. e) To actively participate in research activities and bring out quality research papers. f) To participate in community activities and increase mental health awareness among general public. The infrastructure consists of 15 psychiatry inpatient beds and OPD department providing the following services. De-addiction programme for alcoholics and drug dependants. The Otorhinolaryngology Department, popularly known as the ENT Department, has been relentlessly growing in quality and strength. Today, the ENT and Head & Neck Department, among others, is one department that has registered all-round development. It is fully equipped to meet the diverse needs of the patients who seek treatment for their ear, nose, throat and head & neck related diseases. To be one of the best academic centers in Otorhinolaryngology and Head & Neck Surgery which imparts best available knowledge and Surgical training in the field. Innovation: Innovating solutions and harnessing novel technologies to preserve, protect and restore the vital functions of hearing, olfaction and speech. Policy assistance: Extending technical assistance for National health policy and programs to government and other stakeholders especially for National Cancer Control Programme and National Programme for Prevention of Childhood Deafness. To enable students to be competent to elicit and analyze the symptoms and signs, diagnose the problem and suggest treatment for common ENT problems. To make ENT training interesting by arousing curiosity and generating self-learning and there by improve overall performance. To maintain above 95% pass in UG and 100% in PG exams. To have Randomized controlled trials and ensure each of the staff members have atleast 2 publications with good impact factor per year. To ensure every staff member is trained in atleast 1 subspeciality and in medical education. The spacious, well-ventilated Out Patient Section can accommodate four patients at a time. The patient examination cubicles are in fact so roomy that even minor surgical procedures, if need be, can be conducted there. However, there is a separate Operation Theatre for doing Minor Procedures also. Various surgeries of ear, nose, throat, head and neck, ranging from the simple to complex, are done at the built-to-specification Operation Theatre by professionally qualified and competent surgeons. The success rate of the surgical operations done here is comparable to the very best elsewhere. However, cost of surgery here is almost 30 per cent of what it would be in a city hospital. No wonder, seldom a need arises to refer a patient to bigger city hospitals for consultation or treatment. The motto of the department, in keeping with that of the hospital, is: Quality health care at an affordable price. The ENT and Head & Neck Department provides diagnostic and curative procedures like FESS, Pan Endoscopies, Audiometry and OAE, Tympanometry, Micro-Ear and Head & Neck Cancer Surgeries. The made for each other combination of excellent infrastructure matched with human resources with enviable credentials and rich experience has made ENT and Head & Neck an exemplary department. The department provides round the clock treatment and care to inpatients as also to meet emergencies. The State-of-the-Art 14 Operation Theatres which includes multi-specialty theatres like Paediatric Surgery, Neuro Surgery, Urology and Plastic Surgery. We also manage Causality and trauma centre under Anaesthesiologist & in-charge officer. We are managing seriously injured trauma patients, Snakebites and many poisoning patients in our 25 bedded Causality. We are having 5 PAC centres in the hospital for evaluation of patients. We have identified a link Doctor to endorse infection control practices. He is not only involved in training staff, PGs and Paramedics but, also supervise all the infection control practices in ICU and theatres. We have couple of Staff members certified as ACLS Instructors and are imparting and certifying our Interns, PGs and Paramedics in BLS and ACLS. By these programs we not only train our colleagues but also improve the quality of our Resuscitation. Apart from conducting regular CMEs and scientific programs we also identify and felicitate Doctors for their service to the population. We do felicitate best outgoing PGs from our Department every year. All our staffs are involved in Research activities, many are ongoing Research projects and couple are funded projects as well and we are involved in lot of publications in Good Journals. To be a department of excellence through imparting Quality Anaesthesia training, offering Optimal Anaesthesia care for surgical patients including Critical care and Pain relief and conducting research in the related areas. To Demonstrate understanding of basic science relevant to Anaesthesia, Critical care & Pain Management. To perform Pre-Anaesthetic Evaluation, Administer and Monitor Anaesthesia to surgical operations (including super-specialty), perform resuscitation and pain related blocks under supervision and independently. To Show communication skills, understand medico-legal aspects and update themselves with attending CME’s, conferences and participate in research activities. Evaluation of Newer medications for Attenuation of stress response to Laryngoscopy and intubation. Management and outcome of patients presented with organophosphorus and organochlorine poisonings. Evaluating various Additives used for Regional Blocks. Assessment of Regional Blocks using Nerve stimulator and Ultrasonography. Evaluating the usefulness of various Supraglottic Airway Gadgets. The department of Obstetrics & gynaecology has been providing quality care to patients in and around the district of Srikakulam. We strive to provide finest education to students, postgraduates as well as future practitioners in our specialty. All our faculty are committed to teaching, scholarly pursuits as well as patient care. Our team of expert specialists in the field of obstetrics and gynaecology provide emergency obstetrics care all around the clock to patients who are referred in critical condition. To be a department of excellence by striving hard to provide high quality & Innovative health care for women by advancing knowledge through excellence in research, quality education and training of the health care professionals . To provide quality obstetrics and gynaecology care helping improve women’s health. To strengthen subspeciality areas like infertility and gynaecology oncology. To gain expertise in training healthcare professionals to provide medical care of international standards. To provide comprehensive education to medical students (Undergraduates and postgraduates) and resident doctors to achieve excellence in the profession and motivate them to be life-long learners. To co-ordinate the strength and talent of individual faculty members with the need of the department and to facilitate to collaborate individual and departmental efforts. To promote quality clinical and translational research. To demonstrate understanding of basic science relevant to Obstetrics and gynaecology. To perform examination upon an obstetric as well as gynaecology patient. Know the management of common diseases. Monitor labour, detect abnormalities in labour progression. Recognize emergencies, provide basic life support. Gain surgical skill under supervision and independently. To display communication skills, understand medico-legal aspects and update themselves with attending CME’s, conferences and participate in research activities. To provide excellent radiological services with advanced medical imaging. To impart quality training to undergraduate and postgraduate students. To promote Research & Publications among faculty and students. To provide quality imaging services to patient population of srikakulam and surrounding areas. To create an atmosphere of academic excellence. The Department performs round-the-clock MRI, CT, ultrasound, X-ray and special procedures. We are equipped with state-of-the-art 1.6 T MRI scanner only MRI machine in whole of Srikakulam district and is one of the best in Andhra Pradesh. A 16-slice MDCT unit and four ultrasonography units form the main workhorse of the department. The department has six static units (with fluoroscopy facility) along with nine mobile X-ray units. We also have a dedicated X-ray mammography unit. There are three dedicated workstations for reporting CT, MRI and X-rays. We also perform CT- and USG-guided interventions such as such as biopsies, aspirations and hepatobiliary interventions. In addition to in-house services, we also actively participate in health camps conducted in and around Srikakulam. The Department is also actively involved in various research projects that are aimed at enhancing our radiological footprint and also help to improve patient outcomes in this territory. The department has a huge repository of rare and interesting cases, own museum and library, and three classrooms. Thus the department is actively involved in patient care, teaching-learning activities and research. To become a centre of excellence in clinical dermatology, research and training for the region. To train, upgrade the knowledge and expertise of students, paramedics, medical officers and specialists in Skin, STI and Leprosy. To develop sub-specialty clinics like Pigmentary, Contact dermatitis and Pediatric dermatology. Treatment of all types of Skin, hair and Nail disorders.